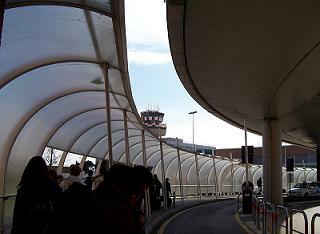 Marco Polo Airport is the main airport in Venice and 8km from the city centre. It has 115 international destinations and flights to Europe, Canada, USA, Russia and the Middle-East. There are no trains from Marco Polo Airport to the train stations in Venice. Two bus companies have scheduled services to the city: ATVO and ACTV. The journey takes 30 minutes. The ATVO bus is preferable for the comfort. It’s a tour bus with plenty of luggage storage under the bus and rides non-stop to Piazzale Roma. ACTV bus (line 5) is more a city bus and you have to take your luggage on-board of the bus. From Piazzale Roma travelers can take the public water bus to their hotel or to walk. This is the timetable of the ATVO bus. The taxi over land is an easy way to travel, certainly if you have lots of luggage. The taxi from Marco Polo Airport to the terminals at the Marittima & San Basilio cruise port cost around €50. The historic centre of Venice is a pedestrian zone. Land taxi’s can’t drive to the hotels in the historic centre but stop at the square at Piazzale Roma. Travelers have to take the water bus from here or to walk to their property. Taxi fare to the historic centre is €40-€45. To the Mestre district (on the mainland) is €40. Much more fun is to take the Alilaguna public water taxi between Marco Polo Airport and Venice. Alilaguna has 3 different water taxi lines from Marco Polo Airport. The public water taxi’s of Linea Blu (blue) and Linea Rossa (red) sail to Murano, Lido island and St. Mark’s Square. Linea Blu is also going to the Venice cruise port (total 80 minutes). Line Arancio (orange) connects the airport with Piazzale Roma, Grand Canal, Rialto Bridge and St. Mark’s Square. This boat line is a good choice if your hotel is in the heart of the historic centre. An one-way ticket with the public water taxi from the airport to the historic centre is €14 (online) or €15 (ticket office). A return ticket cost €25/€27. The ticket fare includes 1 suitcase and 1 hand luggage. Each extra bagage cost €3. An one-way ticket shared water taxi transfer cost €25 per person (2 persons in a boat is the minimum). Tickets for the public water taxi are sold in the arrival hall and online. The shared water taxi has a fixed route and is not sailing directly to the cruise port. Water taxi’s connect Marco Polo Airport with Venice historic centre and the islands in the lagoon. Tickets for the water taxi are sold in the arriving hall or at the boat pier. 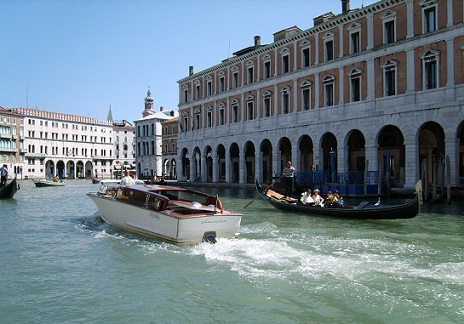 A private water taxi to the historic centre is about €100 – €125. The boats can transport up to 10 persons with suitcases. It’s also possible to take a water taxi boat to the airport; price is the same. The journey takes 20-25 minutes. It’s the most convenient way of travelling to your hotel but also the most expensive. Hotel Marco Polo is a 3-star property close to Venice Airport with more than 1060 reviews (8.1). The hotel can arrange a shuttle to the airport and cruise terminal. An airport hotel can be a good solution especially if you have an early flight or late arrival.